Seattle, WA’s Decibel Festival has been rocking strong for eight years now, delivering an amalgam of sound and vision driven by technology that happens once a year for Seattle’s discerning art and music scene. The 2011 Decibel Festival (Sept. 28 – Oct. 2) bridges the gap between technology and creativity through visual art, workshops, panel discussions and cutting-edge electronic music performances at various venues across the city. The event draws some big names to the rainy city but maintains a cutting-edge lineup of artists who aren’t necessarily the headliners you’d expect but instead some deep choices in performers who bring evolution and new ideas to performance. Decibel has always had a hand in left-field art presentation and this year seems to follow suit with an eclectic lineup that includes Green Velvet, Amon Tobin (and his ISAM audio/visual performance), Martyn, Mad Professor, Ital Tek, Bok Bok, Mux Mool, Quantic, Oval, dOP, Ulrich Schnauss, Martin Buttrich, DJ Krush, Mike Huckaby, Tanner Ross, SunTzu Sound and many more. In fact this festival seems to push new music more than other events that use headliners to draw the crowd. Decibel pulls its own crowd of discerning (often bald and be-speckled) art fans who want to catch the latest movements in electronic music and digital art. As such, Dubspot will be attending Decibel 2011 to cover the latest in music movements. We are also bringing the school on the road and will be running a couple workshops on music creation with Professor Nalepa and also a special session with Detroit’s Mike Huckaby (who has been tearing up charts recently with remixes.) These workshops will happen on Friday, September 30th. Stay tuned to our blog for more detailed information on these workshops very soon. Advance tickets for all 31 showcases and the 2011 Decibel Festival Passes are all still available through our our TICKET PAGE. Not only do you save money on advance tickets/passes, you avoid potential sell outs. If you purchased a Decibel Festival Pass online, you can redeem it at general will call, which will be hosted at Fred Wildlife Refuge, located at 127 E. Boylston in Seattle’s Capitol Hill neighborhood. Will call hours are 12PM – 12AM, Wednesday through Friday. In addition to hosting the general will call, individual showcase tickets can be purchased at Fred Wildlife Refuge. This is also where the 2011 dB Conference will be taking place (see conference schedule below). Decibel will have a guest booth at the hotel, which is located at 1112 4th Avenue. Keep an eye out for the Decibel signs in the lobby. In addition to being the official hotel for the 2011 Decibel Festival, the W Seattle will function as the headquarters for Decibel Press and Photography. If you’re traveling in for the festival or just looking for a place to eat, shop or sight see, this page will walk you through some of our favorite places. Complete with venue maps and transportation guides, the dB Visitor Page is a great resources for anyone attending the 2011 Decibel Festival. 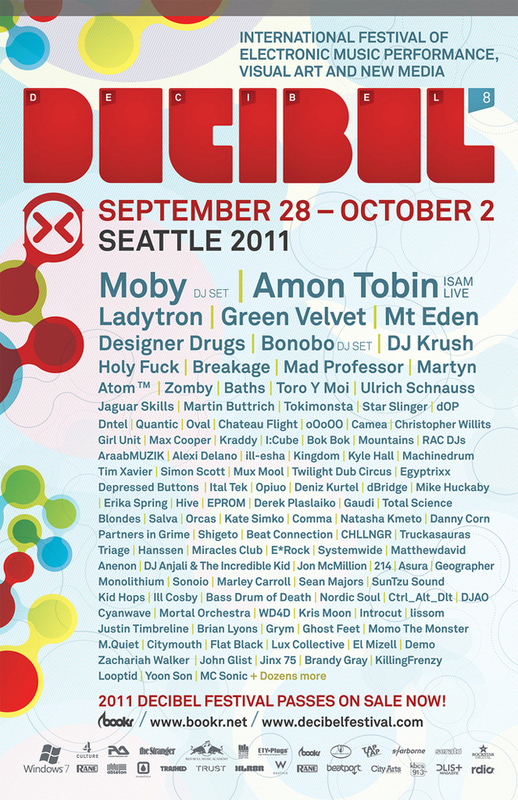 With over 144 artists from over a dozen countries performing across 31 showcases throughout 15 of Seattle’s most prestigious venues, the 2011 Decibel Festival program is simply massive. If you haven’t yet, we recommend familiarizing yourself with this year’s list of showcases and then plotting your experience with the most up-to-date SCHEDULE or the our smart phone apps.